The teeth cleaning cost for you and your family is always going to be way less than the costs of the more invasive dental treatments you may need if you don’t invest in regular deep cleaning teeth procedures. If you’re wondering, does deep cleaning hurt, when you visit the deep cleaning dentist in Brooklyn, we will do everything possible to make it painless and comfortable. Come to our Brooklyn dental clinic to receive the most thorough deep dental cleaning. Meet our family, cosmetic dentists in Brooklyn Alex and Igor Khabensky DDS to get the fastest & painless deep cleaning treatments. Sometimes, just the thought of a deep teeth cleaning may put you off of the procedure. But this simple and painless oral treatment shouldn’t make you apprehensive as it’s an integral part of keeping your teeth and mouth healthy and clean. In the hands of the best teeth cleaning dentist in Brooklyn, your comfort always comes first, so you have less to worry about and more reasons to keep those regular dental cleaning appointments. Though brushing your teeth properly and consistently one to three times a day helps keep your mouth healthy, professional dental cleaning performed by a cosmetic dental clinic in Brooklyn ensures you have no other problems. And the exam that accompanies the cleaning helps prevent future problems from occurring. Plaque and tartar build up is what happens when you don’t brush your teeth. But this build up can still occur over time even with regular brushing. Deep teeth cleaning (also called scaling and root planing) is the best way to remove plaque and tartar buildup in your mouth that a normal toothbrush can’t remove. Regular professional cleaning is crucial for preventing periodontal disease. And the affordable cost of teeth cleaning is much cheaper than the more serious problems you may have down the road without it. You may ask, does deep cleaning hurt? The answer to that question is no — especially when performed by an experienced and professional dental team. If you need it, a light anesthetic or mouth numbing medication may be used to make sure you’re comfortable. Your dental hygienist at Family Cosmetic & Implant Dentistry of Brooklyn cleans your teeth, removing plaque and tartar with the aid of a small mirror and a dental scraper. Once the plaque and tartar are removed, the dental hygienist uses a high-powered electric toothbrush, accompanied by gritty toothpaste, to provide a thorough cleansing. For those wondering how long does a teeth cleaning take, the process takes anywhere from 10 to 30 minutes. 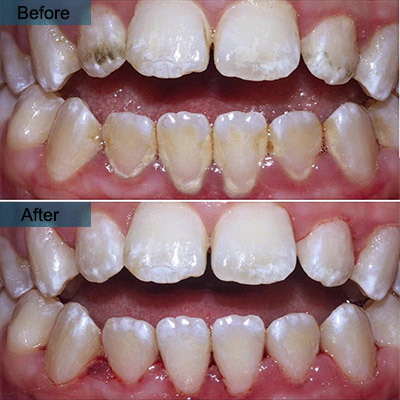 Dental deep cleaning teeth takes longer and usually is performed by your Brooklyn general dentist. If you have dental insurance, it typically covers the recommended bi-annual cost of teeth cleaning. The average cost of teeth cleaning is less than $200, but the cost varies, depending on how much deep teeth cleaning you need and how often you visit your deep cleaning dentist in Brooklyn. Though deep teeth cleaning cost may seem expensive, the benefits of having deep teeth cleaning far outweigh the price of not having it done. Taking the proper measures to care for your teeth, mouth and gums reduces the risk for a wide range of health issues. Fresh and clean breath. By brushing your teeth twice a day and flossing at least once a day, your breath stays fresh. Gum disease prevention. Learning how to properly brush your teeth — including a healthy scrub on your gums — can ultimately prevent periodontal disease from occurring. Remove stains and whiten. Depending on the kinds of toothpaste and products you invest in, stain removal and whitening are two byproducts of teeth brushing. Drinking dark-colored beverages like coffee and syrupy cola drinks can stain your teeth, so with regular professional cleaning, you reduce the likelihood of stains and improve your winning smile. Time savings. You spend less time at the dentist’s office and more time with your family, enjoying pain-free life when you invest in the little time it takes for regular dental cleaning. Build important dental relationships. Your professional dental team gets to know you and your family, your medical and dental history and your oral goals when you visit twice a year. If and when you do need other general or cosmetic dental services, you’ll already know the best deep cleaning dentist to call! Do you have any questions about the dental Teeth Cleaning (painless dental deep cleaning) procedure in Brooklyn? Would you like to schedule an appointment with the best rated deep teeth cleaning dentist Khabensky DDS of Family Cosmetic & Implants Dentistry of Brooklyn? Please contact our dental clinic for a consultation with the dentists Alex and Igor Khabensky DDS.